Mr. Ice Cream man, I would like some ice cream~! I would like two mango flavoured please. Does he play music just like the real Mr. ice cream man here so that all the kids know he's coming. 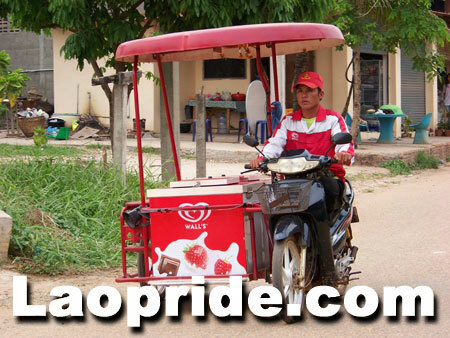 Ice cream men on three wheel bicycles make homemade ice creams and they sell them independently. These ice creams tends to be cheaper than ice creams made from a company, and they are usually not very cleanly made. 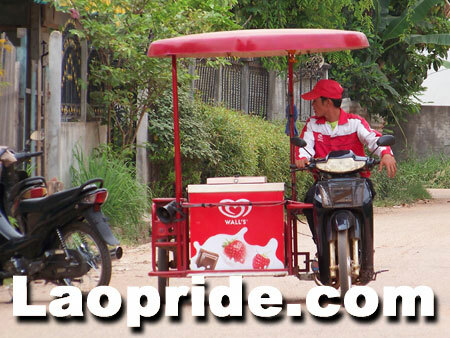 So for cleanliness and better taste, always look for the Wall's ice cream men in red when buying ice creams in Laos. Can you post a picture of Wall's Ice-cream men so I will be able to readily recognize it? I already have, in the first picture. I can't believe it. This is literally making me laugh! Where do these authentic Ice Creams get imported from? How much for an ice block? Okay, my bad. haha. :: embarrassed :: Thank you! Authentic ice creams cost around $1. Cornetto ice creams are nice. As for the girl with too much make up, are those cones actually $1? Thats how much an equivalent ice cream would cost here, but I assumed that it would have been somewhat cheaper in Laos. The independent locals will still make many sales, regardless of what I say on here. Cornetto cones are just under $1 US. They're expensive than the coconut flavoured homemade ice creams that sell for around 40 US cents. Company ice creams are expensive to cover their import and electricity expenses, and obviously they need to make some profit from each sale. Sound like Admins is a pro-business, Capitalist. Is it a ice block, ice cream, or something or other? It doesn't even sound Lao. Perhaps it's a loan word. French, maybe? Is it a loan word? Perhaps Pali or Sanskrit, because it doesn't sound Lao? One too many syllables.